*Appearance: Silverheart is a medium-sized cat, with a muscular and compact body, which is devoid of fat. He has a broad and rounded chest, and slender legs. His straight tail is of medium length. He has a completely grey coat with a few stripes of darker grey. His eyes are a deep forest green. *Personality: Silverheart has a sweet personality. He is very non-confrontational and very compassionate. He is very spiritual and believes very strongly in the powers of StarClan. Losing his mentor, Birchshine, so early in his apprenticeship has saddened him greatly, as Birchshine was a relatively young she-cat, and he had expected many more seasons with her. He is saddened by this loss, and it has turned him into a quieter, more sorrowful cat. *History: Silverheart was always a curious kit. He always loved to tumble into the Medicine Cat den and see what the Birchshine was doing. When he became closer to six moons old, he begged to be Birchshine's apprentice. Birchshine thought about it, and eventually agreed. Silverheart -then Silverpaw- was overjoyed and tried his hardest to learn everything there was to learn about being a medicine cat. When the sickness struck, he and Birchshine stuck together through it all. Despite the tragedies going on around them, Birchshine and Silverheart grew close. To be honest, maybe closer than they should have, being Medicine Cats. But then Birchshine was struck by the sickness herself, and Silverheart threw himself into a fury to find the cure, only to watch his closest friend and adviser waste away in her sickness. 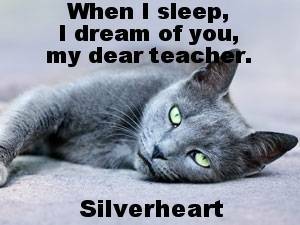 When she died, Silverheart was left not fully trained, and originally without his Medicine Cat name. He traveled to the Moonpool, where Birchshine greeted him as a member of StarClan and gave him his name, Silverheart.